Wine Market Council and The Nielsen Company present their annual report on the state of wine in America. Despite the state of bruised bank accounts and high unemployment, Americans still like their wine. This nation of thirsty wine drinkers, predicted to become the world’s largest wine consuming country this year, nudged up the consumption numbers in 2010, according to the Wine Market Council (WMC) and The Nielsen Company in their annual report on the state of wine in America. They presented their findings at The Museum of Modern Art in Manhattan last week. The gentle 3.2% upward trend is thanks largely to Millennial wine drinkers, who remain on a wine discovery trajectory regardless of the price point. "The Millennials have spare cash and the rest of us don't," said Danny Brager, vice president and group client director for The Nielsen Company's Beverage Alcohol Team. An estimated 92% of Millennials are drinking the same amount of wine or more than last year. • Trading down to less expensive wine has stopped (wine price points). • Consumers (especially Millennials) are moving back up to the $9–$20 wine category. 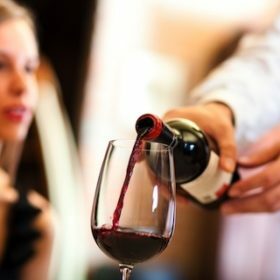 • Baby Boomers remain pragmatic about wine in the glass versus money in the bank. • Everybody has discovered good quality wine at lower prices (and will resist price increases). • Restaurant wine sales are improving but won't return to mid-2000s levels until 2015. • Wine continues its gallop onto retail shelves as more than 20,000 new outlets have opened or launched wine shelf space since 2005. Moscato, Malbec, Tempranillo, red blends and rosé wines dominate consumer interest. But what we actually drink didn't change from 2009 to 2010: Chardonnay, Cabernet Sauvignon and Merlot remain the top three varietal wines, accounting for 46% of all wine purchased. Merlot continues to slide as Pinot Noir grows but Pinot Noir remains in fifth place, behind Pinot Grigio/Pinot Gris. As always, seven out of 10 wines Americans buy are domestic, primarily from California. In imports, France continued to take a beating with an 8.9%% fall after a 7/9% drop in 2009. Australia was down by 6.5% in 2010 and 7.2% in 2009. Argentina and New Zealand wine imports continued to grow by double digits and German and Spanish wines are making a comeback. Do you see yourself on this chart? As the 2010 US Census figures emerge, both WMC and the Nielsen Company reports are beginning to analyze where wine purchases fit in, particularly in ethnic communities. In early data compiled by Nielsen, Hispanic wine buyers favor Spanish-label/origin wines but Nielsen's tracking predicts this will change to domestic brands as the wine-drinking population expands and matures. What consumers will see on the shelf and the table in the near future depends on how wineries and brand owners use the report results. In any case, consumers remain cautious about all purchases—and luckily, wine remains one of them.